The majestic Royal Bengal Tiger is the national animal Bangladesh. Highly endangered, the Royal Bengal can now be mostly be found in the Sundarbans. One of the largest of the ‘big cats’, it has extremely bold and striking colour pattern – making it perhaps the most magnificent and sought-after fiery beast of the world! The vivid pattern of stripes on the glossy skin serves as a very effective camouflage in the grasses and foliage almost in all the seasons. The male averages 3 meters in length including 1 meter of tail and wiighs about 180 kg., though much larger specimens have been known. The giant one is the Siberian tiger, almost 4 meters long and weighing about 300 kg. 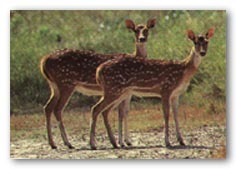 The Sambar Deer is the most widely spread deer species in the world, covering many countries in the Asian continent. It is also one of the larger members of the deer family. Some males are known to weigh up to 300 kgs and can grow to a height ranging from 135 – 150 cms at the shoulders. These animals have a life expectancy ranging between 16 – 20 years. They are the favorite prey species of the tiger. A large sambar can feed a feed tiger for up to 4 days. Unlike the Spotted deer, which shouts an alarm and darts away at the sight of a predator, the sambar tends to alertly watch and keep giving alarm calls until the danger has passed. A reason due to which many of them fall prey for predators. 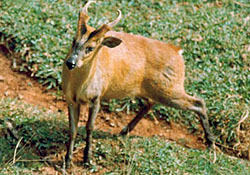 The Sambar can be found in the wooded hills of the north-east and east. The barking deers are small deer of the forests. They are noted for barking like dogs when alarmed and during the breeding season, and for having tiny antlers and tusklike canine teeth. Primates also abound all over Bangladesh, but most abundantly in the Sundarbans and the Hill Tracts. 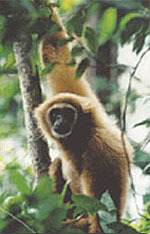 Amongst the various species you will find the Hoolock Gibbon (the only ape in the subcontinent) as wells as langurs, and various species’ of monkeys. The elephant is mostly found in the wild in the Hill Tracts and is also a protected animal. Elephant habitat in Bangladesh is confined almost entirely to the forested hills of the east, and even there habitat is giving way to monoculture plantations of teak, rubber, and tea. 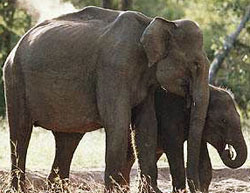 Only 200-350 wild elephants are thought to survive, with herds moving between Bangladesh and neighbouring India. There may be around 50 domestic elephants.